i had no clue that there was something called a tag. 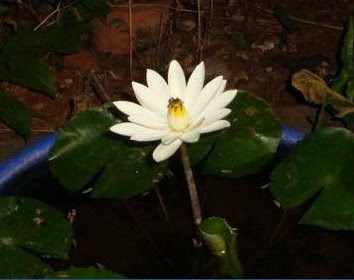 as for the pic-its a very good one.clearly,the lotus was the centre of attraction in your backyard. I have my own story abt this flower. Mother India went on a quest for this flower and finally got it. Mother India could not stop yapping abt it. "This flower blooms once a year and only in the nite. And its supposed to be lucky .. . . ." Finally the flower bloomed. And I spent arnd 30 mins to take snaps - me and the flower, jus the flower, mom and the flower.kudos. I had my Civil exam the next day. And I screwed it up like WAT? From then I considered it as a bad luck flower. But the pain is it started blooming more. damn. @Damn, how often does it bloom? It stopped in my ponds after that flower in the pic.